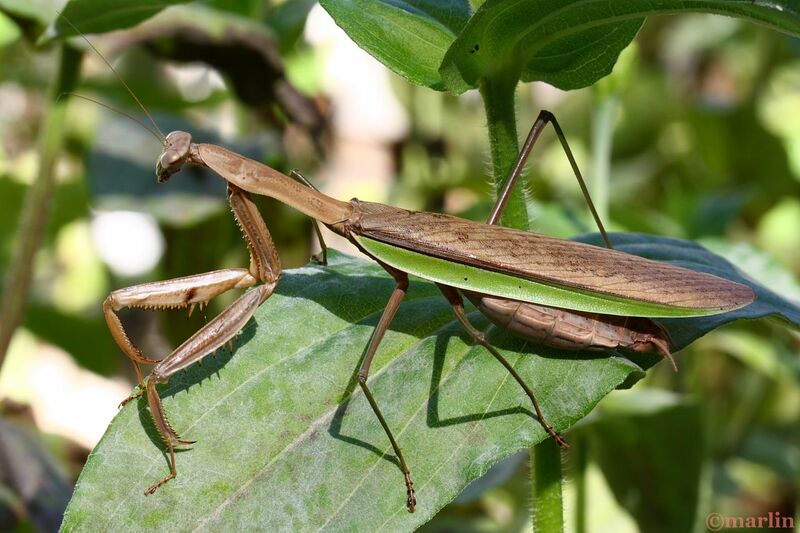 Mantis is from Greek, meaning prophet or seer. Also commonly called the giant Japanese mantis, this species is one of the most spectacular insects most people will ever see here in the United States. This gravid female began hanging around my flower gardens in late September of 2015. She is 110 millimeters long – about 4 1/4 inches. It was fairly obvious she was about to lay her eggs, an event I was very interested in seeing. Alas, she moved around a lot, and her camouflage was perfect for the tall zinnia flowers she favored – you could be looking right at her from 4 feet away and not see her. One day she disappeared and I never did find her egg case, called an ootheca, and I had no mantids at all this year. Bummer. 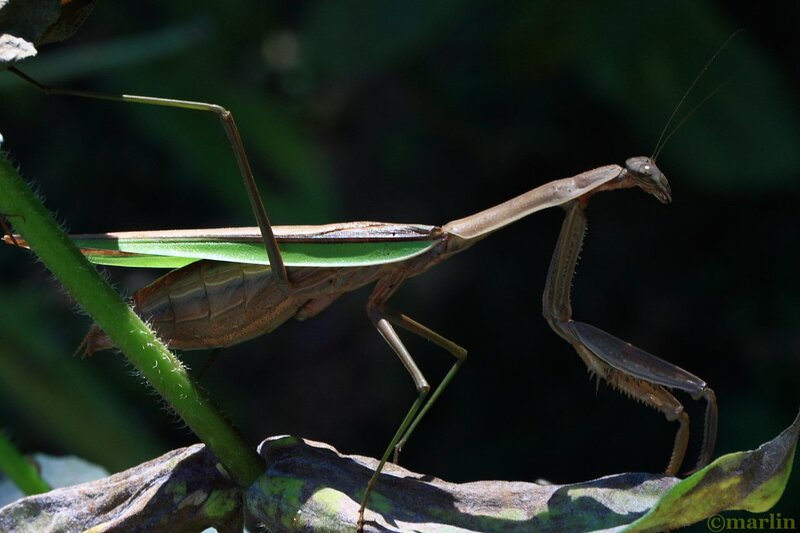 One summer long ago, I watched as this praying mantis snatched a grasshopper out of midair. 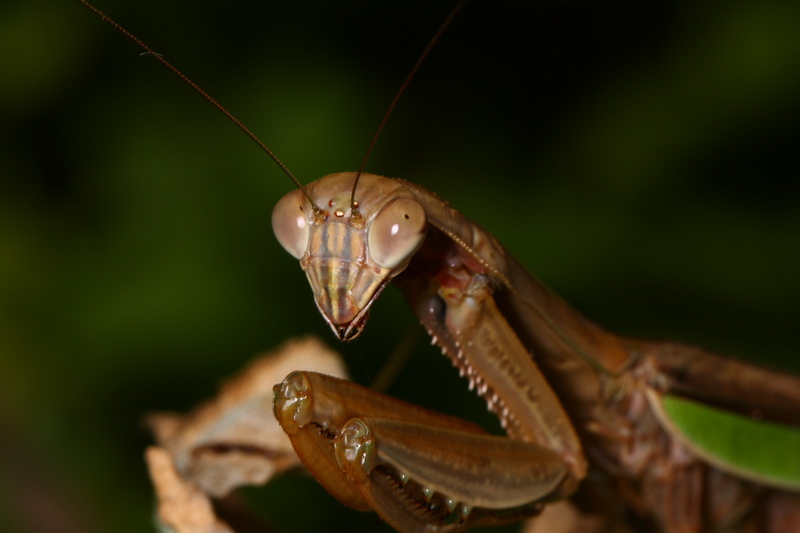 Scientists using high-speed cameras have captured the mantis strike at 30 to 50 one-thousandths of a second — faster than the eye can see. 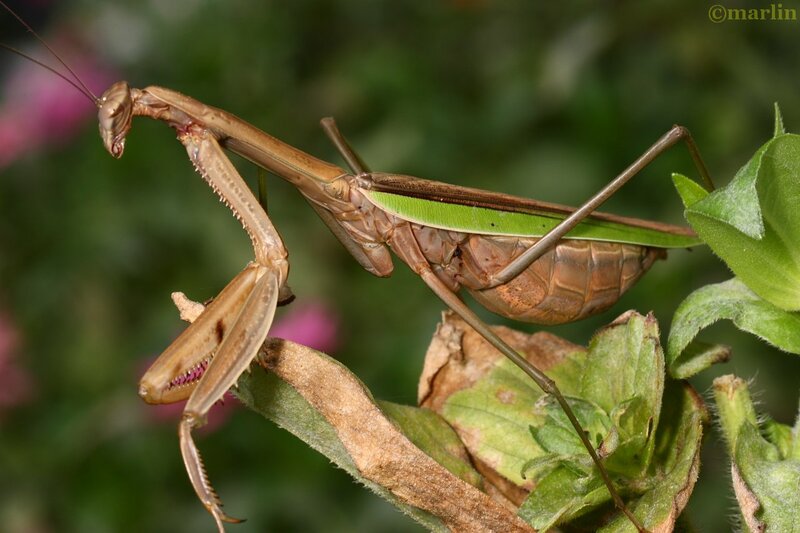 Mantids rely on their exquisite camouflage while hunting. They usually remain in ambush completely motionless, letting prey blunder into range, or they do a slow stalk much like a cat. 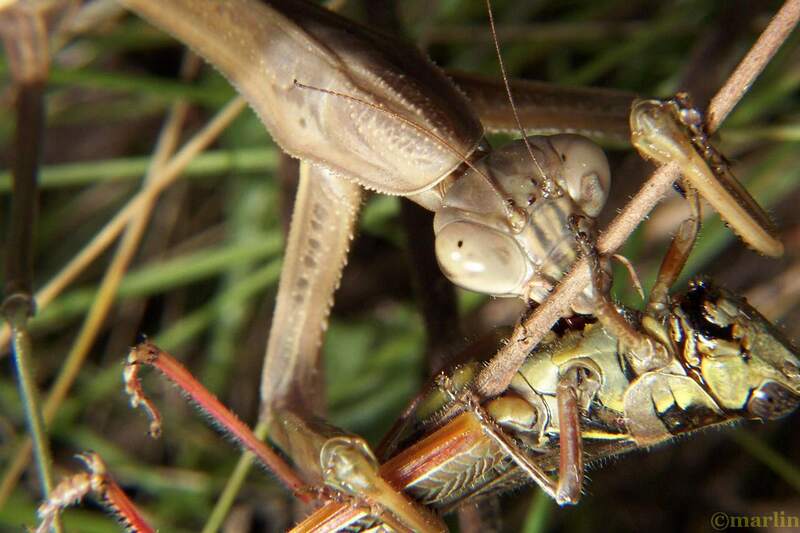 True to type, this mantis first attacked the neck of the grasshopper, a soft spot in the armor. Thus, the struggle quickly ends and the hunter can dine in peace. The strong prominent mouthparts of this predator have evolved into a very efficient ripping and tearing mechanism. My camera clock shows this attack and feast took somewhat less that 6 minutes. She was not a fastidious diner – various parts were dropped and only the soft abdominal segments were consumed. I don’t think these killing machines have any trouble securing a meal any time they want. The compound eyes themselves are a work of art – their faceted nature always presents the appearance of a black pupil pointed directly at you. 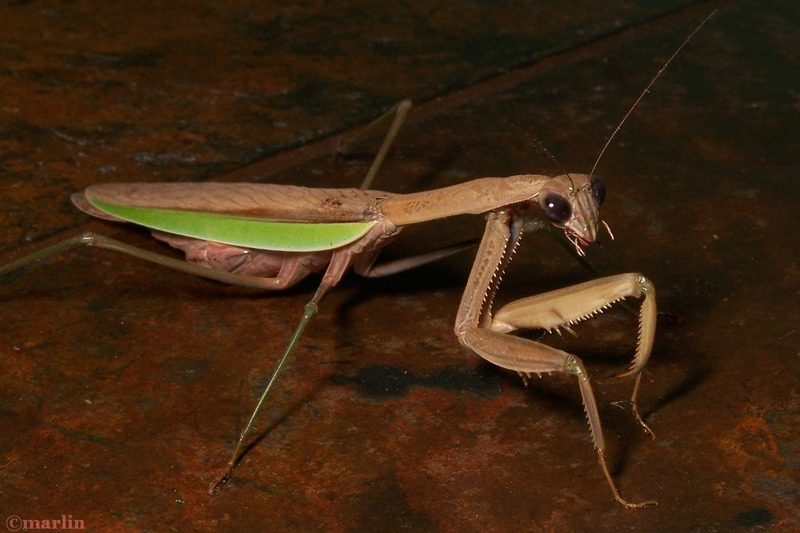 It is such a convincing optical illusion that it was only recently that I even took note of it and made myself think about the fact that mantids do not have eyeballs or pupils. In addition to this curious feature, the entire surface of the eyes change color according to the amount of ambient light – they are light green or tan in sunlight, and chocolate brown at twilight or in low light conditions. Many other arthropods also exhibit illusory pupils in their compound eyes. Late-season female praying mantis out hunting on November 3rd, (northern Illinois) is demonstrating the changing nature of the mantid’s compound eyes under low-level light. It’s one of a whole bunch of differing camouflage tactics this highly-evolved insect exhibits; its stock in trade rests on invisibility, and when it starts getting dark, who needs big conspicuous eyeballs? Are you looking at me? Strange and wonderful is the armor-plating on this beauty. If you’re lucky enough to study one up close, say a prayer for all creatures great and small, and don’t you dare stick it in some terrarium! I happened to startle one of these critters out in the prairie one time – I didn’t know she was there – and she exploded into fight right next to me and flew past my head. Wow! Those giant flying wings make an enormous rustling, buzzing noise. She scared the crap out of me! The sight of this lumbering beast as if out of nowhere was a sight to behold. A wild turkey did the same thing to me last winter, with similar results. 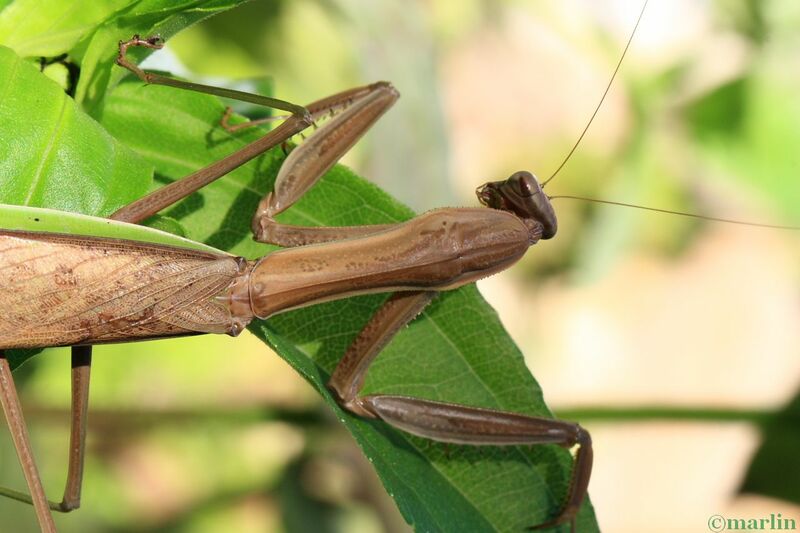 All you ever wanted to know about the Chinese mantis can be found, badly-written, at Wikipedia (I helped). Thank you for looking at my pictures. I hoped you enjoyed them! –Ed. Tree Encyclopedia / North American Insects & Spiders is dedicated to providing educational resources for our users through large macro photographs of flora and fauna in their natural habitat.